Thank you to everyone who joined us on April 20 at the beautiful Four Seasons Silicon Valley Hotel at East Palo Alto for the 21st Annual "And Justice For All" Awards Luncheon. Over 200 people attended this annual event, a celebration of our community’s commitment to justice for all. We also thank all of our sponsors for their generosity. Our afternoon began with a special video about a grandmother who wanted to become the legal guardian of her granddaughter. Check out the video here. The audience was then moved by the remarks of exceptional keynote speaker Noreen Krall, VP, Chief Litigation Counsel, Apple, Inc. The Legal Aid Society of San Mateo County proudly presented awards to this year’s three remarkable winners. Wilson Sonsini Goodrich & Rosati received the Guardian of Justice Award. This award is given each year in recognition of volunteers whose efforts are steeped in a commitment to justice for all the children, families and seniors in our community. “Wilson Sonsini Goodrich & Rosati recognizes how it is critical that low-income people with limited resources have access to quality legal services. Making those services available to people in need is the cornerstone of our pro bono program.” – Steve Guggenheim, co-head, Pro Bono Committee. The Natalie M. Lanam Award was presented to Dave Paliughi, Director, Special Education Department, Redwood City School District. 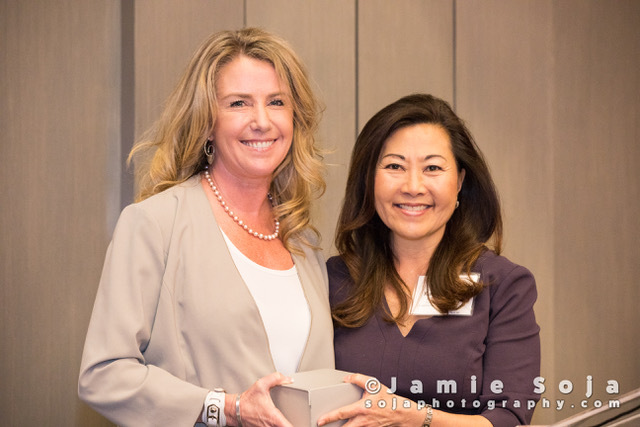 This award is in memory of community leader Natalie M. Lanam whose passion for justice for all compelled her to become an important advocate for the Legal Aid Society of San Mateo County. Aaron, Riechert, Carpol & Riffle, APC, received the Dorothy M. Wolfe Award. This award is in memory of one of the first women attorneys in San Mateo County, noted for her deep belief in equal access to justice. Dorothy Wolfe was an ardent supporter of the Legal Aid Society of San Mateo County throughout her career. In a dollar-for-dollar match, the Legal Aid Board of Directors challenged the audience to raise $15,000, and you did it. Thanks to your generosity, Legal Aid will receive $15,000 from our Board of Directors for a total of $30,000. Thanks to everyone! The Annual “And Justice For All" Awards Luncheon always proves to be a special reminder that as a community we can collectively fight social injustice through civil legal advocacy.